The dream final. World Number 1 vs 2. At stake, was history, as is usually the case when Novak Djokovic and Rafael Nadal play a Slam final. A win for Djokovic would bring him within 2 titles of Nadal, and in 3rd place overall, overtaking the legendary Pete Sampras. It would also make him the outright title leader at the Australian Open, at 7 titles. A win for Nadal would take him to 18 Slams, 2 short of Federer. Further, a win for Nadal would make him the first man in the Open Era to have won at least 2 titles at every Major. In the end, it was as one-sided as it could get with Djokovic cruising to a straightforward victory, winning 6-3 6-2 6-3. Djokovic set the ball rolling as he came out of the blocks in full flow. A break in the first game gave the first glimpses of what was to come. Nadal started the game scratchy, unsure and as the match wore on, Nadal was subjected to relentless pressure. Nadal could not get a foot into the match as Djokovic kept piling the pressure with solid service games and destructive deep returns. Rarely is Nadal ever made to look ordinary and he makes his opponents work incredibly hard to win every single point. Today, however, the template was flipped. Nadal’s usual approach of using his forehand crosscourt shots to set up the point was completely neutralized by Djokovic’s rock solid backhand. In fact, Djokovic is the only opponent that can force Rafa into such a fundamental shift in his game. An early barometer of Rafa’s rhythm is his down-the-line forehand, which is usually an ominous sign. However, today, he did not look in control at any point in the match. Djokovic was in complete control on serve and put relentless pressure on Nadal’s serve throughout. At many points in the match, Nadal looked utterly clueless while facing Djokovic’s serve. There were moments he had absolutely no read on the direction of the serve. This would prove to be a defining point in determining the outcome of the match. The overall theme of the game was one where Djokovic was dictating terms right from ball one. Nadal showed a few moments of brilliance, but the problem was that they were few and far between. Nadal’s service was lauded all tournament and he had been winning service games quickly with a more aggressive approach. Today however, he looked under the mat, with an irrepressible Djokovic completely dictating the proceedings. The Djokovic serving and groundstrokes were the decisive factor today, as he was in total control of the pace and rhythm of the game. He stretched Nadal all around the court and induced error after error as Rafa tried to get that little bit extra and ended up conceding a slew of unforced errors. Djokovic’s class on serve, his forehand and backhand were dialed in and his defensive skills were on full display. Overall, it was simply world class from him today and Nadal had no answers as he was completely outclassed. In the end, both gladiators showed a touch of class in the presentation. 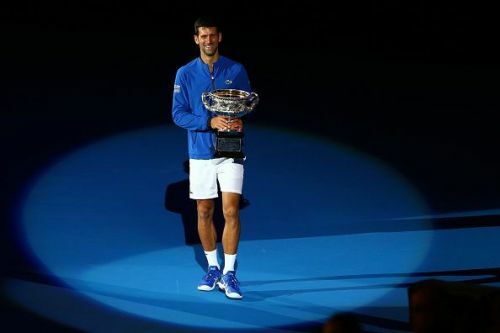 Djokovic highlighted Nadal’s fighting spirit on returning from injury. In that context, it was a great achievement for Rafa to make the final. It is just that he came up against an absolutely on-song Djokovic. This definitely makes the 2019 French Open a mouth-watering clash to look forward to. What's next for Roger Federer, Rafael Nadal and Novak Djokovic?